Denise Grover Swank has written several books that have been featured on both the New York Times and USA Today Best Seller lists. Like many self-publishing authors, she started off chasing a traditional deal, but eventually made the switch to doing it all on her own. Her first year self-publishing she sold a little over 26,000 copies of the four titles she had published. Now, she is a hybrid author working in the New Adult, Urban Fantasy and Mystery genres where she continues to dominate the charts. During this week’s episode we will talk to her about the 23 page business plan she wrote shortly after she began her career as a self-published author. Why is it important to write a business plan? What type of information should be included? And, how much of a roll does she feel her business plan played in her success? Denise has written many of her thoughts about business plans in a three part series (click the links to visit each of the articles). Denise first caught the attention of readers everywhere with her urban fantasy series Chosen. She has expanded the world and the series since the release of that first book to include a total of seven titles, both full length novels and short stories, set in that world. She is currently working on a new urban fantasy series called Curse Keepers. Currently, this series consists of a short story, titled This Place is Death. The novella that provides the back story and serves as a prequel. The first novel, The Curse Keepers, was published in November 2013. 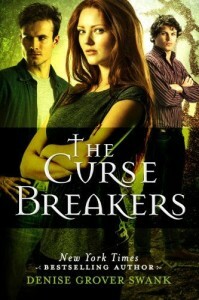 The second book in the series, The Curse Breakers, will be published April 29th, 2014. She will be releasing a new adult contemporary romance this Thursday. The book is called Business as Usual. It’s the third title in her Off the Subject series. You can see all of Denise’s titles on her Amazon page. Additionally, you can learn more about her and sign up to her mailing list on her website. In addition to being a best-selling author and a full-time mom, Denise is also a member of The Indie Voice. The Indie Voice is a writer’s collective made up of a group of other writers who work in the same genre. Members of this collective, all of them best-sellers, banded together to share their knowledge in a book titled: The Naked Truth about Self-Publishing. If you are a fan of the type of books Denise writes, I would encourage you to look into joining a Facebook group devoted to celebrating her work and the work of one of her author friends Jana DeLeon. Click here to visit Club Del-Swank. I’d like to end this post by attaching the cover to The Naked Truth about Self-Publishing and a question for our loyal viewers. Question: Do you believe that the abs in the picture bear more of a resemblance to Carl Sinclair or to David W. Wright? Please leave a comment on the post to let us know your thoughts. Did Denise mention a closed FB group for self pubbed authors? I couldn't find where but I thought she did. @MarkECooperAuthor She did. The closed group is called Club Indie. You have to have self-published at least one book to qualify for membership. If anyone else wants an invite then leave your details below. John will be sending them out in a minute. @Demelza Carlton @Carl Sinclair invite is out. @Carl Sinclair Am I forgiven for my precipitate departure last week? I swear it won't happen today. @Carl Sinclair @Demelza Carlton With torture, electrodes, needles and the like? @PatrickStemp Stemp letting the Team Carl down man. @Carl Sinclair @PatrickStemp Guess I need to keep a calendar. @PatrickStemp @Carl Sinclair Just follow my official cheerleader, RemarkableReads. He'll keep you updated. Do you have a good online writers forum as an alternative to kboards? Question, could Carl Sinclair get more awesome? @RemarkableReads It may seem unlikely at this stage, but yes, I can get more awesome. I've gone up like 10 points of awesome today at least. @Carl Sinclair @RemarkableReads I see your humility is non existent once again. Carl as usual. @RemarkableReads @Carl Sinclair When is the Talking About Carl podcast starting btw? Not sure if this was answered, but if so Ill catch it when I listen back. With blog tours and advertisements less effective today, what should a brand new author do to get noticed? @RolandDenzel She talked mainly about working with other authors in cross promotion. You can also look at some of the things that both @BrennaAubrey & @darrenwearmouth did with their launches. @Carl Sinclair @RolandDenzel @BrennaAubrey @darrenwearmouth thanks! LOL - seriously, didn't anyone know Aussies eat roo meat? Makes good dog food. It's pretty gross though. I hate the after taste. @Carl Sinclair @Demelza Carlton Agreed, mate. Like crocodile - you have to taste it to say you have, but it's fine never to bother again. @Carl Sinclair @Demelza Carlton Is there roo curry? @RolandDenzel @Carl Sinclair @Demelza Carlton Yep. Sure is. How long are Denise's books? I know there are 28 of you listening here. Start asking questions. That means you @CristinHarber you sneaky ninja. @Carl Sinclair see if I tell you about my super secret stealth mode again. :) Catching up now. Question: You said the Amazon algorithms favor you if you produce a book every 3-4 months... Do they directly favor you, or do you just mean that it favors business plans in general. And if it does favor you directly, does it favor the KDP account, even if you're publishing through different pen names? Or does it favor you by author name listed? @Ronny Khuri Good question. Is this tied to your author name? Is it through Author Central? @Ronny Khuri Hope that helped Ronny. @RolandDenzel @Carl Sinclair @Ronny Khuri Don't mention lamb curry.... I'm still too fresh in my mind. @JayChastain Yeah my kids were just the same.